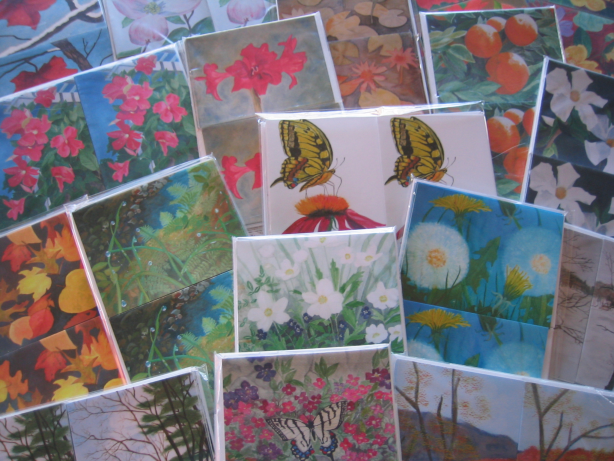 My notecards, 5½ inch x 4¼ inch reproductions of some of my original paintings are sold in packs of 10 with envelopes. You may choose a single design or customise your order from the designs shown. When ordering please quote the picture title and the reference number as shown in the Notecard Gallery. Each pack is wrapped in clear plastic suitable for gift giving as shown here. Bulk orders of an individual design will not be packaged in tens except by special request. The images in the notecard gallery carry a copyright mark. This is not present on the printed cards. A selection of my cards, varying according to season, is now available on sale at American Plant, 10106 Georgetown Pike, Great Falls, VA 22066. Phone: (703) 438-8880. Packs of 10 notecards are $20 plus postage and packing. A personal greeting, invitation details or customised text can be printed inside each card in black, blue or red for an additional $5 per pack of 10 cards. For orders within Virginia an additional 5% tax should be added. For delivery within the USA your order will be shipped by Priority two day mail. Quoted USPS rates include postage and packing and delivery confirmation service. Correct at Oct 6 2008.
International shipping will be calculated for each individual order. Please contact us for a quote. If you would like to discuss your own requirements or have comments about this website you can contact me via this link LindaJonesArt or via the one at the top of the page. The contents of this web site and the art displayed within are the Copyright of Linda Jones and LindaJonesArt © 2005 - 2011. Reproduction without permission is not permitted. Please note all links from the LindaJonesArt website to external websites will open up in a new browser window or new tab depending on your local settings.